Cambridge has excellent, dense, fine, well-locked fleece that his father, Accoyo Camion, puts on his cria and the stretchy, type conformation of his grandfather, Accoyo Baron. His fleece is high luster. He has shown well, taking several blues. Cambridge does let color come through when he is bred to color, like his father. 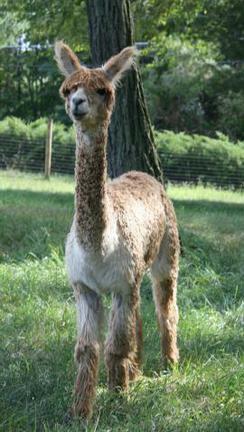 Visit us to get your hands on his cria born this spring! Josie is a fantastic female who has taken Blues and Reds at all the shows she has been at and is expected to have some fantastic cria when paired with our Meadowgate Peruvian Cambridge later next year. She has remarkably bright luster and a very soft fleece. Her lock structure is perfect along with her great confirmation. Josie is one of a kind! This "Princess" can be yours... breed her (or we will) and continue the genetics of MacGuyver, Bruxo and Camion! Leah is a sweet girl, ready to add value to your farm.